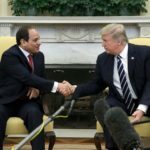 A top religious authority in Egypt has condemned as "extremist and racist" comments made by Republican presidential frontrunner Donald Trump that called for a ban on Muslims entering the United States. Trump's statement on "preventing Muslim immigrations" to the United Stated came after last week's California shooting spree by two Muslims who the FBI said had been radicalised. Egypt's Dar El-Iftaa, the top authority that issues edicts to Muslims, said Trump's statement would generate tensions in American society, of which 8 million people are Muslims. "This hostile perception of Islam and Muslims will increase tension within American society," Dar Al-Iftaa said in a statement on Tuesday. "It is unfair to punish all Muslims because of a group of extremists whose criminal actions are repudiated by Islam." "We cannot restrict [the labeling of] extremism and terrorism to one religion or one country," the statement added. The Islamic institution urged Americans to reject Trump's call, saying his statement "will lead to conflict… and inflame hate– in turn posing a threat to social peace in the United States." "This will provide an opportunity for extremists of all parties to realise their criminals aims," the statement concluded.